In this guide, you'll learn how to create a job position in YoungCRM Recruiter. There are six steps in the creation of a job position. We'll go through the six steps one at a time down below. At the bottom of your screen, you'll see a status bar that shows you which step you are currently at. The first part of creating the job position is internal which means that the description you create in this box will not appear in the advert. Basic information is visible in the advert. Here, you can select start date for the job, select a deadline for applications, workplace and job type. Workplace and job type are things the applicant can sort by in your organisation's job bank. In this box, you can set the publication date for the advert and when it's taken down. The contents of this box will appear in the job advert. You can design your text by using the different tools in the toolbar. The information entered in this box will appear in the job advert. Use this box to tell the applicant who they should contact if they have any question in regards to the job position. In this box, you can activate or deactive general video questions or select if the video questions should be 'About you' (about the applicant). When the previous boxes has been filled out, you can send the job advert to matching candidates in your job bank. You can also publish the job advert to the job portal. This part of the setup resembles that of regular forms. You can insert different data fields you want the applicant to answer. These data fields are created in the organisation settings under 'Recruiter fields'. The applicant is presented with a success page when the application form has been filled out and sent to you. 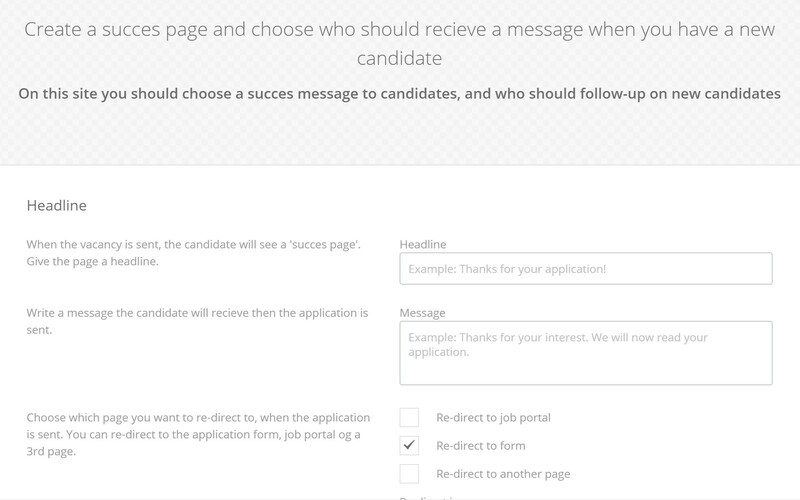 In the settings of the succes page, you can choose to redirect the applicant - leading them to another page after having sent their application. We recommend that you select 'redirect to job portal' or 'redirect to other page', which could be to your website. When a candidate has sent the application, they should receive an email receipt that tells them that your organisation has received the application. 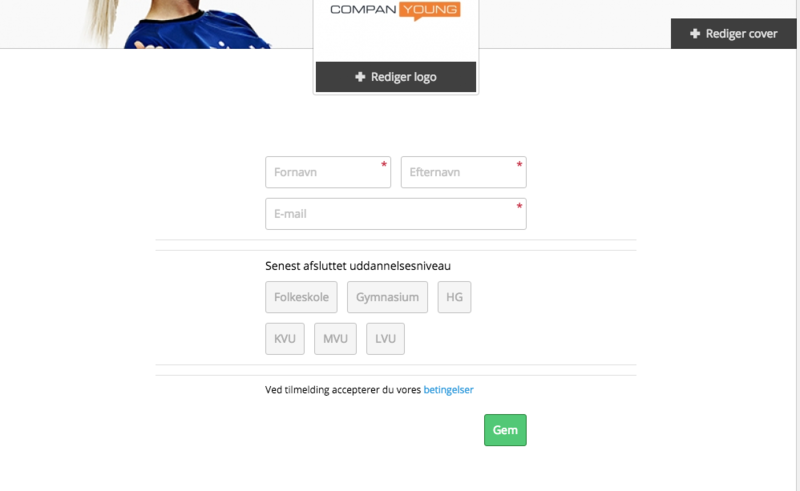 In the fourth step you can design the email the applicant will receive. After having uploaded logo and cover photo as well as written the email, you can click 'preview' in order to see what the email looks like for the receiver. The fifth step is called 'Rating'. Here, you are evaluating the weighting of the different parameters. If you have created some 'rating categories' that you do not find relevant any longer, they can be skipped in this step. In the final step, you publish your job advert. When clicking the green button 'Publish', you enter a site where you can share your job advert. Here you can copy the link to the job advert, share the job advert by sending an email or share it via social medias like Facebook and LinkedIn. When clicking the green button 'Finish', you are redirected to your job positions. You can see the different job positions in your job bank and whether they are open for applicants or not and if the position is active or not.